Makes the audio for picking up Meridis's Beacon VERY loud. Just edited .fuz files from skyrim. Do whatever you like with them. Changes the audio on picking up Meridia's Beacon to be VERY loud. Should only conflict with anything that edits the Meridia's Beacon audio files. 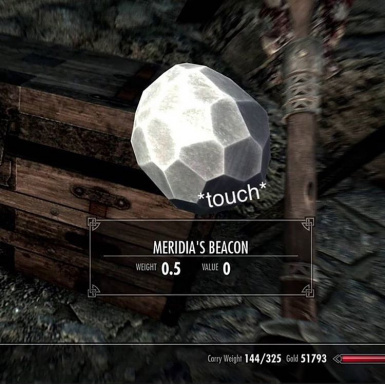 Part of the audio for the scene where you pick up Meridia's Beacon for the first time is shared with the scene if you meet Meridia on Mount Kilkreath before picking up Meridia's Beacon, so that will be VERY loud as well. I'm fairly new to modding I will try to answer any questions or issues but this mod should not have any or cause any.